San Cristobal volcano, also known as El Viejo, is the highest and one of the most active volcanoes in Nicaragua. It is located near the northwest corner of the country near the city of Chinandega, 110 km WSW of the capital Managua. San Cristobal has had frequent small to medium-sized ash eruptions reported since the 16th century. When first observed by the Spanish in 1528, the volcano was in strong eruption and was described as sending "smoke" during the day and "flames" at night. Explosive activity continues. Volcanic Ash Advisory Center (VAAC) Washington warned about a volcanic ash plume that rose up to estimated 8000 ft (2400 m) altitude or flight level 080 . 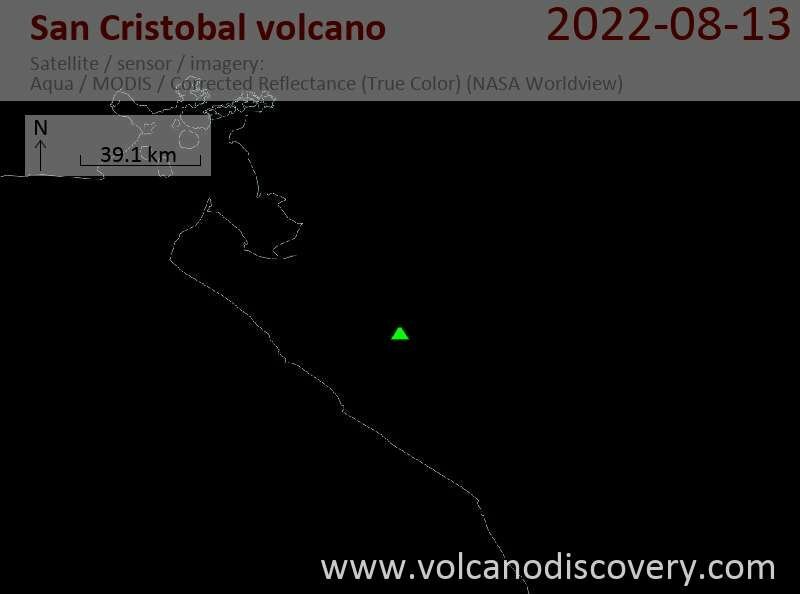 San Cristobal Volcano Volcanic Ash Advisory: POSS NEW EM. San Cristobal Volcano Volcanic Ash Advisory: VA NOT SEEN IN STLT. San Cristobal Volcano Volcanic Ash Advisory: CONS LGT VA EMS MOV SW.